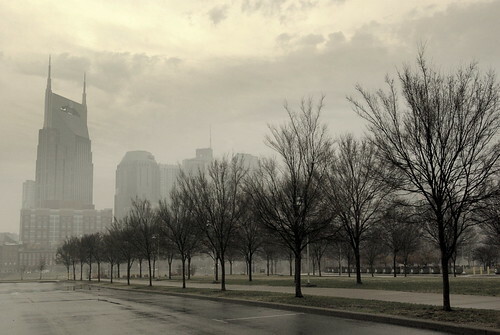 Good morning, Nashville. Last night’s storm system dumped about 1-3 inches of rain on us here in Middle Tennessee, bringing some strong winds and tornado scares along with it. The Nashville Electric Service reported that there were an estimated 24,500 people without power last night, but had restored all but about 1,140 as of this morning. A couple of stoplights were still out during the morning commute and debris reportedly littered the roads, though we suspect that most of it is clear by now. If you see any major blockages, though, call 862-8750 to report it to Metro. The folks in Antioch seemed to get battered the worst with several churches and homes damaged, but fortunately no one was hurt! So we’ll see you next week, thunderstorms. Budget woes continue for Metro Schools. Metro Schools Director Jesse Register anticipates some serious budget issues for the 2011-2012 fiscal year. Because they’ve used up all their stimulus funds and depleted their reserves, they could be looking at a budget gap in the tens of millions. Changing course. The Country Music Marathon folks have made some updates to the race course. We’re not sure if these are the same updates they were talking about a few weeks ago or new ones, but either way, here’s some details and the new route map. Bits & pieces. A Saudi Arabian college student in Texas who was arrested for plotting terrorist attacks took some English classes at Vanderbilt … State senators are hesitating a bit on a bill that would start tracking people who buy meth ingredients (like cold medicine) in a statewide database … The Bridgestone plant in Wilson County was evacuated due to a gas leak caused by last night’s storm … The Preds lost to the Blackhawks last night, falling out of the top 8 in the conference standings.